I took a short break from quilt making to complete a quick little project from the Sew Can She blog. It's a toy sack with a see-through window. It's pretty nice for those collections that have lots of pieces. I like how you can see what's in the sack. I made this prototype with the intention of making many more to give to friends. 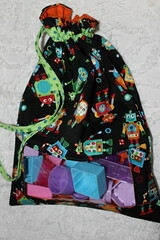 I used robot fabric which is kind of boyish and loaded it up with little girl duplo blocks. They fit nicely in the bag. Now I will make some girly versions for my granddaughters. Here is a direct link to the blog with the free tutorial. I have all these scraps from the herringbone squares baby quilt I made. The fabric is from Jenn Ski's Ten Little Things collection and it is so fun. Because of that I just can't throw away all those scraps. Cutting all those angles left so many of them that I sewed them together and made big blocks out of them. There were also a few strips left that I didn't use when making the herringbones that I used those too. So now I have these crazy squares and I don't know what to do with them. Amazingly, I discovered something about my design board. It really sparks inspiration. First I put the blocks up on the board. Then I discovered a sort of size pattern among the blocks. So I put like width blocks in a column. Before I knew it, I had something that could be sewn together into a quilt top! Now I just have to decide if I am going to frame them in another fabric. I have plenty more from the Ten Little Things line or leave them as is. I think I will call this one Scraptastic because it sure is. It is no secret that I am a big Peanuts fan. I love everything Charlie Brown, Snoopy and Woodstock. The characters are so warm and familiar and remind me of childhood, both mine and my children's. When I see them, I cannot help but smile. When this fabric line was announced, I knew I had to have it. I wasn't sure what I would do with it when I got it but I knew I had to have it. 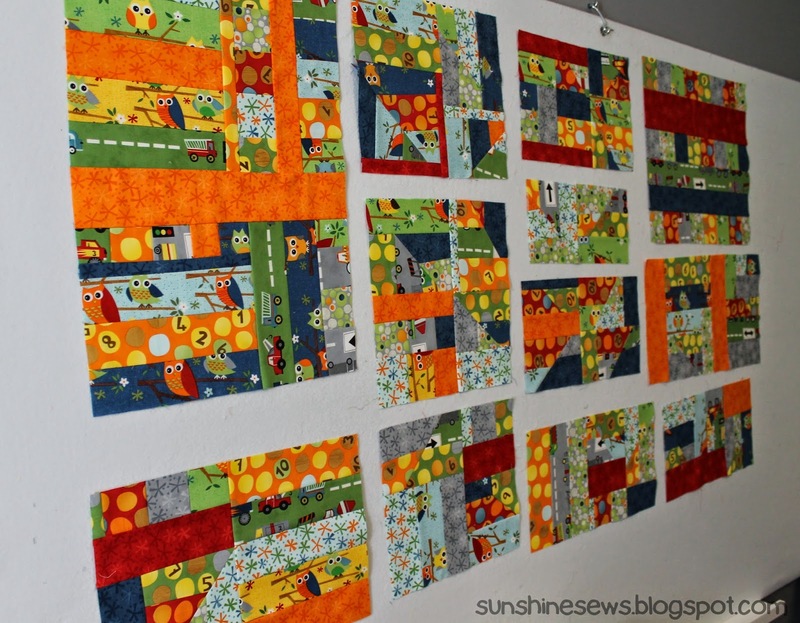 As I perused the Spring 2012 Quilts and More magazine, I came across a pattern that used very large squares. The pattern is called Taking Turns by Monica Solorio-Snow of Happy Zombie. This seemed ideal to frame these fabrics and set them off by themselves which seems a proper way to make them all have a special place. It was a simple pattern that you turned in different directions to put it together. I took the large leftover pieces and made a back out of them. I added a fabric panel that I cut into 4 strips. I couldn't wait to get it quilted. I knew there could only be one special design, a football was the most appropriate thing. So I had footballs quilted all over and I love the way it turned out. I finished this Snoopy/Peace quilt today. It rained all day and with the temps hovering in the low 40s, the heat didn't kick on much making the house both chilly and damp. It was a perfect day to sit and hand-stitch on binding in front of the fire. I always like hand-stitching on quilts in the winter, the quilt itself usually helps to warm me up. I will turn this one in at the next Quilts for Kids chapter sew day. I made a smaller version of my arithmetic quilt from the tutorial I found on the In Color Order blog. In this version I used three and a half inch squares and scaled down the number of rows from the original. I used Thomas the Train feature fabric. I will applique a train across it to add to the theme. 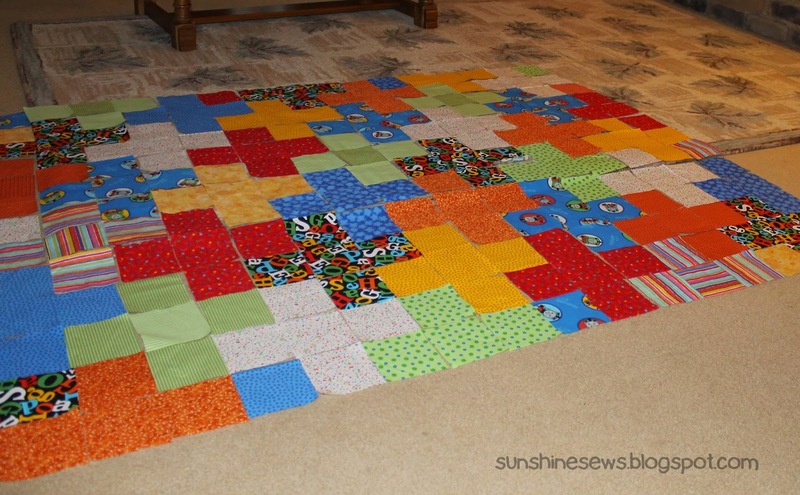 I cut the squares out during our Quilts for Kids sew day however, I decided to lay it all out at home. I knew if I laid it out during our sew day, I would never get it put together by the end of our time there. That would have made it way more difficult to transport it home for finishing and keeping the blocks in order. I decided to put an applique of the state of Wisconsin on the back of my son's quilt. He actually called one of my quilts "a little piece of home" so it seems appropriate to put this on the back of the new quilt I am making for him. I had no idea how difficult this was going to be! The first struggle had more to do with my lack of ambition. I really wanted to make cut out each county in the state from a different color of fabric and piece them all together. That was until I realized how many counties there are in this state. There are 72 just in case you were wondering. Considering I have made quilts where the first instruction was cut 360 squares...this should not be all that difficult however, each one being a custom shape was somewhat overwhelming to me. A friend (thank you, Midge) suggested I use the Wisconsin Tourism map that breaks it down into sections. So we now have the Northwest, Northeast, Central, Southeast, Southwest, South Central and East Central designations. This worked well and for more than me being a little lazy. These shapes would fit on my leftover solid charm squares. How perfect is that!